COACHES at the Oldham Boxing and Personal Development Centre have been celebrating the best run of unbeaten results in the club’s 10-year history. 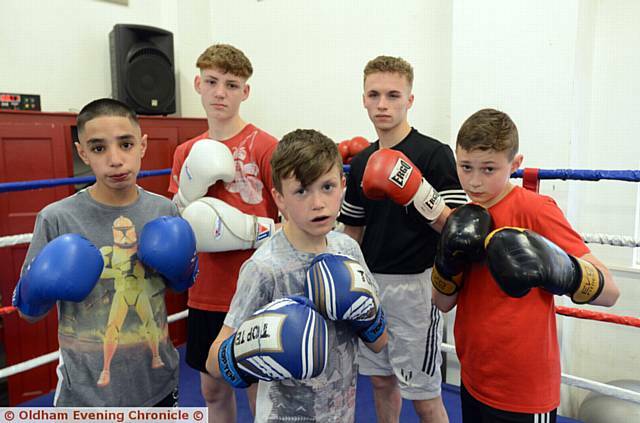 Under the overall guidance of head coach Eric Noi, local boxers have enjoyed success at the club’s own show at the Oldham Sports Centre, the National Schoolboy semi-finals, and the World Series quarter-finals at the famous York Hall in Bethnal Green, London. Kicking off a memorable weekend for OBPDC was Michael Rattigan, who progressed to the final of the National Schoolboy Championships thanks to a hugely impressive win at the Doncaster Dome. Rattigan – fighting in the 32kg minor class – gave a text-book example of counter-punching as he prevailed in his last four clash against previously unbeaten Muhammad Hussein from South Derbyshire. In the final, which will be staged at the Bowlers Event Centre in Trafford Park, Rattigan will come up against John Doherty from the Guildford club. OBPDC star fighter Will Cawley, meanwhile, has been in action at the York Hall after receiving a late call-up to represent the British Lionhearts in the World Series quarter-finals. Olympic prospect Cawley was tasked with taking on seasoned French boxer Abdel Benaicha, a fighter who has been sparring the likes of Anthony Crolla and Paul Butler at Joe Gallagher’s gym in recent months. It was Cawley who prevailed in his contest, however, and in some style. He produced a scintillating performance over the five rounds, perfectly highlighting his undoubted potential in front of the BoxNation TV cameras. Last but certainly not least, OBPDC fighters enjoyed a terrific night at the club’s own show. Joined on the bill by many fighters from rival outfits in the area, there was also a contingent from the Cuban Boxing Club in Spain. Home fighter Will Loveridge was excellent in his 43kg skills bout against Chadderton’s Luke Chappell, while Abdul Muizz Khan got the decision in his 37kg grudge match against Shamil Islam, from the Blackburn Cobras. In the 58kg category, Oldham’s Kyle Tullin produced a barnstorming stoppage victory against previously unbeaten Brandan Bennett from the Ali Boxing club, while arguably the most satisfying victory of the night went to Jaden Landregan. Only recently recovered from pneumonia, Landregan deservedly beat Ali Boxing’s Connor Reilly following three tough rounds. Other results during a great night of action included Qasim Muhammad (Longsight) beating Jonny Kielly (Droylsden), Horia Kheil (Longsight) beating Bradley Ireland (Droylsden), Yuri Collado (Cuban BC) beating Ali Morten (Border City) and Ismael Cortes (Cuban BC) getting the better of Damian Bialis (Derby Lane).